We offer the widest selection of high quality, realistic Christmas trees on the market. Crafted with care to ensure years of enjoyment. primarily true needle™ foliage (80%) for outstanding realism, with classic needle branches (20%) for fullness. primarily pine needles (91%) with a touch of classic needles (9%) for fullness. primarily true needle™ foliage (70%) for outstanding realism, with a small amount of classic needles (30%) for fullness. combination of premium true needle™ tips (70%) accented with classic needle foliage (30%). primarily true needle™ foliage (90%) for outstanding realism, with a small amount of classic needles (10%) for fullness. primarily true needle™ foliage (82%) for outstanding realism, with a small amount of classic needles (18%) for fullness. primarily true needle™ foliage (80%) for outstanding realism, with a small amount of classic needles (20%) for fullness. primarily premium true needle™ tips (50%) with classic needle (40%) branches for fullness, and a small number of pine needles (10%) for added interest. traditional tree with 100% classic needles. comprised primarily of white true needle™ foliage (55%), made fuller by a combination of white classic needles (38%) and white pine needles (7%). primarily true needle™ tips (74%) for realism with some classic needle foliage (26%) for fullness. primarily true needles (90%) for outstanding realism, with a touch of classic needles (10%) for fullness. primarily true needle™ foliage (89%) for outstanding realism with classic needles (11%) for fullness. primarily true needle™ foliage (85%) for outstanding realism, with a small amount of classic needles (15%) for fullness. A Balsam Hill artificial Christmas tree brings all the holiday cheer of a live tree to your home without the hassle or messes that come with them. With our hinged branches and lightweight stands, setup is simple. Your Christmas tree will be ready to decorate in no time! We also offer both prelit and unlit options, so you can choose whether you prefer the convenience of never having to set up lights, or keep the option to change what type of lights you use from year to year. Our most realistic trees are from our exclusive True Needle collection. These are created branch by branch using molds of live branches to meticulously copy every detail of mother nature’s best Christmas trees in bi-colored polyurethane plastic. Our traditional artificial Christmas trees are made from durable PVC which is pressed into a thin paper-like material. Strips of this are expertly twisted into each wire branch, giving the tree a full and fluffy look that harkens back to the trees of Christmases past. Our realistic Christmas trees offer the perfect blend of the more realistic style and a full traditional look. These feature some of the same mold injected branches, but with additional PVC branches filling out the spaces between to give the tree a more robust silhouette. 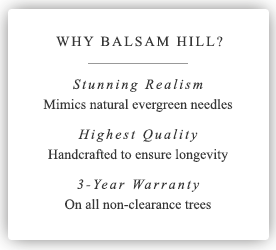 Balsam Hill creates the most realistic artificial Christmas trees ever produced. Designed by Balsam Hill exclusively for our customers, each Balsam Hill Christmas tree is crafted for exceptional quality, beauty and convenience. All trees 365 cm and under in our Vermont Signature, Napa Christmas and Smoky Mountain Christmas Collections come with our standard 3-year warranty. We feature varied types of trees from pre-lit Christmas trees, to unlit Christmas trees and LED Christmas trees. You can also browse through our collections of multi-colour pre-lit Christmas trees and clear colour pre-lit Christmas trees.